Excessive dietary salt (sodium chloride) intake is associated with an increased risk for hypertension, which in turn is especially a major risk factor for stroke and other cardiovascular pathologies, but also kidney diseases. Besides, high salt intake or preference for salty food is discussed to be positive associated with stomach cancer, and according to recent studies probably also obesity risk. On the other hand a reduction of dietary salt intake leads to a considerable reduction in blood pressure, especially in hypertensive patients but to a lesser extent also in normotensives as several meta-analyses of interventional studies have shown. Various mechanisms for salt-dependent hypertension have been put forward including volume expansion, modified renal functions and disorders in sodium balance, impaired reaction of the renin-angiotensin-aldosterone-system and the associated receptors, central stimulation of the activity of the sympathetic nervous system, and possibly also inflammatory processes. Not every person reacts to changes in dietary salt intake with alterations in blood pressure, dividing people in salt sensitive and insensitive groups. It is estimated that about 50–60 % of hypertensives are salt sensitive. In addition to genetic polymorphisms, salt sensitivity is increased in aging, in black people, and in persons with metabolic syndrome or obesity. 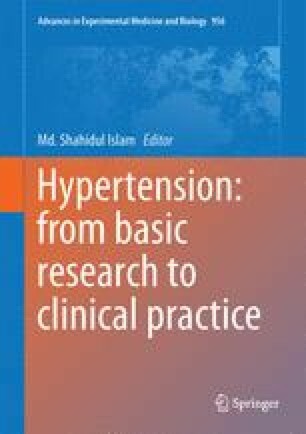 However, although mechanisms of salt-dependent hypertensive effects are increasingly known, more research on measurement, storage and kinetics of sodium, on physiological properties, and genetic determinants of salt sensitivity are necessary to harden the basis for salt reduction recommendations. Currently estimated dietary intake of salt is about 9–12 g per day in most countries of the world. These amounts are significantly above the WHO recommended level of less than 5 g salt per day. According to recent research results a moderate reduction of daily salt intake from current intakes to 5–6 g can reduce morbidity rates. Potential risks of salt reduction, like suboptimal iodine supply, are limited and manageable. Concomitant to salt reduction, potassium intake by higher intake of fruits and vegetables should be optimised, since several studies have provided evidence that potassium rich diets or interventions with potassium can lower blood pressure, especially in hypertensives. In addition to dietary assessment the gold standard for measuring salt intake is the analysis of sodium excretion in the 24 h urine. Spot urine samples are appropriate alternatives for monitoring sodium intake. A weakness of dietary evaluations is that the salt content of many foods is not precisely known and information in nutrient databases are limited. A certain limitation of the urine assessment is that dietary sources contributing to salt intake cannot be identified. Salt reduction strategies include nutritional education, improving environmental conditions (by product reformulation and optimization of communal catering) up to mandatory nutrition labeling and regulated nutrition/health claims, as well as legislated changes in the form of taxation. Regarding dietary interventions for the reduction of blood pressure the Dietary Approaches to Stop Hypertension (DASH) diet can be recommended. In addition, body weight should be normalized in overweight and obese people (BMI less than 25 kg/m2), salt intake should not exceed 5 g/day according to WHO recommendations (<2 g sodium/day), no more than 1.5 g sodium/d in blacks, middle- and older-aged persons, and individuals with hypertension, diabetes, or chronic kidney disease, intake of potassium (~4.7 g/day) should be increased and alcohol consumption limited. In addition, regular physical activity (endurance, dynamic resistance, and isometric resistance training) is very important.